SEO companies have gotten a bad reputation over the years. Unfortunately, not without just cause. Too many businesses have been burned by supposed SEO experts who guarantee unrealistic results, or use dishonest black hat tactics to try to cheat the system. Even in 2018, our inboxes are still assaulted with spam emails from companies on the other side of the world, claiming to have the secret to ranking #1 on Google. 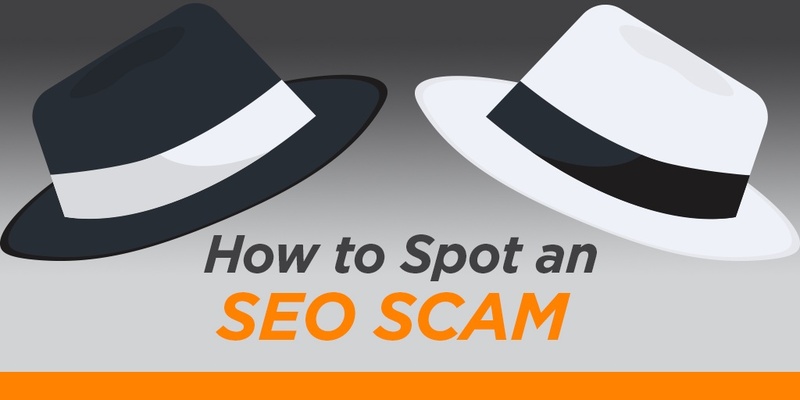 So when you’re looking for SEO services, what are the major red flags, and how do you spot an SEO scam? Behold, an invoice from a company we had never heard of, for a service we didn’t need or want (especially since we’re an SEO company). Clearly, this is a scam – we see a ton of them every day (just ask our IT services division). 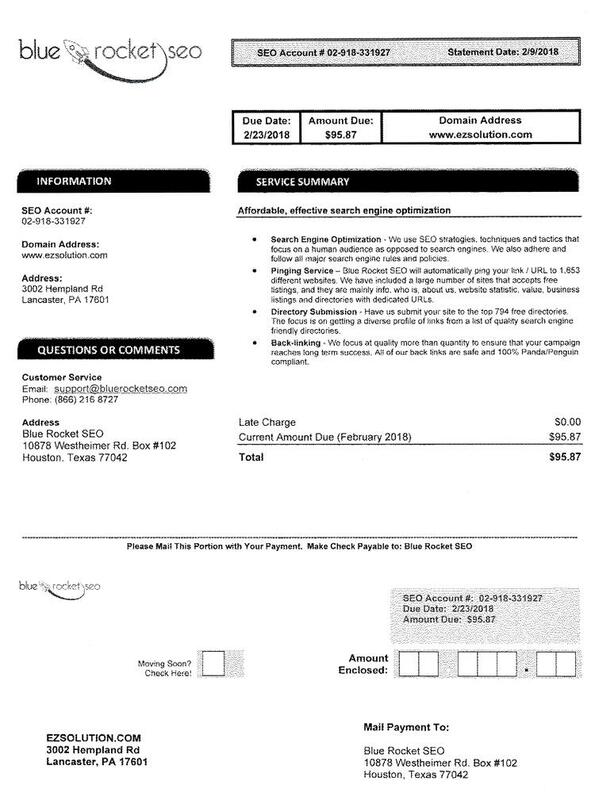 But even if this wasn’t a fake invoice, it raises some serious issues about legitimate SEO services. On the surface, this is actually a pretty convincing fake. Under the service summary, it talks about SEO strategies that follow search engine rules, and gaining safe, quality links. Sounds pretty white hat. Looking closer, there are a few things that made us raise our eyebrows, but especially if you’re not familiar with SEO, it can be hard to separate a bad company from a good one. This is not an opinion. It’s actually a direct quote from Google. While this particular company doesn’t try to guarantee rankings or claim they have a special relationship with Google, many disreputable SEOs do. In reality, Google’s algorithm always looks for the best, most relevant results, and there’s no way to assure you’ll reach the top spot. Not only is the algorithm constantly changing, but search results vary based on who’s searching when, where, and how. A good SEO should be able to help you drive more quality organic traffic to your website, but it’s generally irresponsible for them to guarantee specific rankings or results. A link is like a vote that endorses the value of your website. Imagine if a company promised a political candidate thousands of votes in an upcoming election. Sound shady? That’s essentially what many black hat SEO companies do. Ideally, link building is an organic process where people discover your content and love it so much that they share it and link back to you. The best SEO companies can do a lot to optimize your content and build relationships with industry and media outlets that may help promote it. A company who is promising tons of backlinks is probably doing so with low-quality or even toxic links that may hurt your business. The SEO scam above specifically talks about free directory links. This is true. There are thousands of business directories that list your business’s name and contact information, which are important, especially for local SEO. However, you don’t just want to get a link from these directories, you also need to ensure your business information is accurate and consistent. Furthermore, you still want a more diverse portfolio of links than just directories. SEO is complicated, no doubt. Between algorithms and keywords and content optimization, there’s a lot to know. 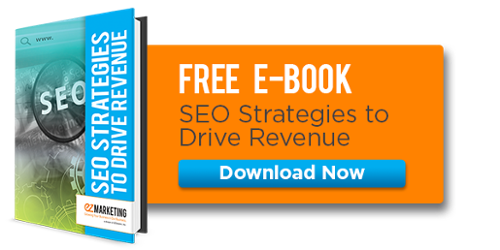 But despite the complexity, best practices for SEO are well researched and well documented. They’re no secret. Any SEO company that claims to have a secret process or can’t explain what they’re doing and why is suspect. Trust us, they haven’t singlehandedly cracked Google’s algorithm. A good SEO company should be able to outline a specific plan for your business, including things like keyword research, competitor research, website audits, content creation, and outreach or link building strategies. Years ago, SEO may have been little more than keyword stuffing. Today, while keywords and technical SEO are still an important piece of the puzzle, search engines have gotten a lot more sophisticated. Search engines are trying to return the best and most relevant answer, which means they’re looking for the source with the best information. Content is how you provide that relevant answer. 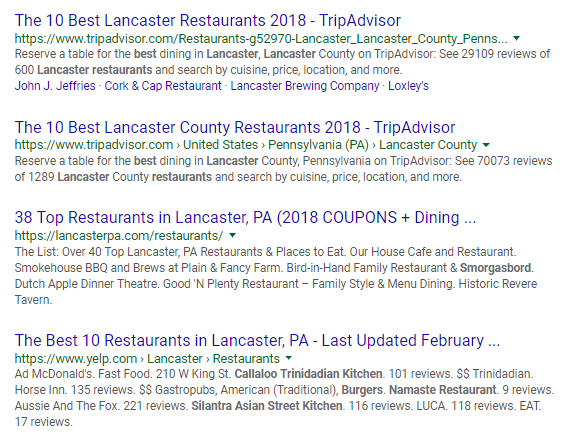 For example, try Googling “best restaurants in Lancaster, PA.” The top organic results aren’t restaurants. They’re all articles or lists of popular restaurants in the area. Search engines know that content about the top restaurants is more useful to the searcher than simply listing the restaurant websites in the search results. SEO and content are inextricably linked today. You can’t do SEO without quality content to optimize, and it’s a waste of time for you to create great content that no one can find. Whenever you’re looking at SEO services, make sure you’re having a conversation about content. If a deal looks too good to be true, it probably is – and that remains true here. Scam SEO companies will always claim that they do better for less, but the simple truth is that good SEO services don’t come cheap. According to a survey from Rand Fishkin of Moz, SEO agencies reported monthly billings ranging anywhere from $500-10,000/month per client. Small or medium size businesses would likely fall closer to $500-2500/month. Regardless, the $95.87 on the fake invoice is suspiciously low. Likely, that would only pay for an hour or so of SEO work. Think there’s an SEO company out there that can do keyword research and write, publish, and promote optimized content that will improve your search traffic in an hour? Me neither. If you’re working with or considering working with an SEO company, and you have any doubts about their services, don’t be afraid to ask questions. Ask the company to explain their service offerings, and get second opinions from other SEO experts. We’re always happy to answer questions and/or assist with your SEO service needs, plus you can post questions on active SEO chat forums like Moz Q&A.